In November 2004, an event, having been long-awaited by all the Buddhists of Russia, happened – the arrival of His Holiness the Dalai Lama XIV to Kalmykia. 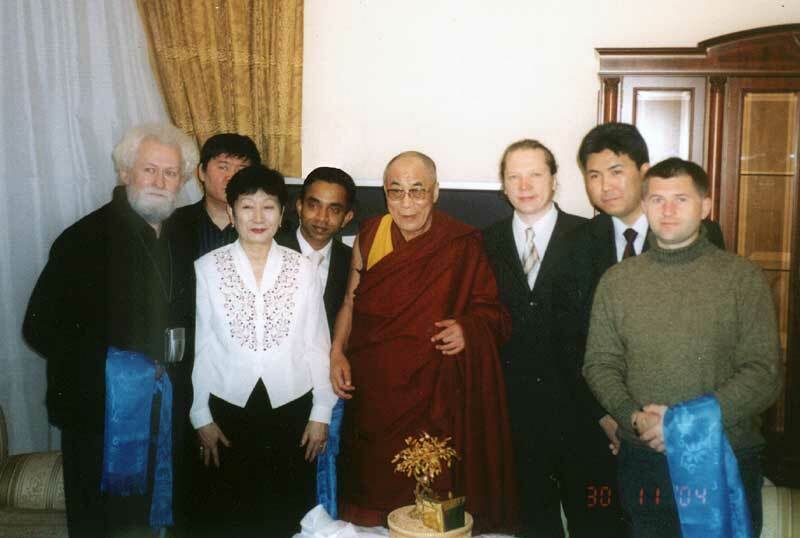 On November 30th 2004, His Holiness had a talk with a delegation from the Moscow Buddhist Society concerning the construction of the First Buddhist Temple in Moscow. During the audience in Kalmykia, His Holiness was expressing his pleasure that there would be a Buddhist Temple with a Stupa in the capital of Russia, which will signify the faith in Buddha’s teachings and unite all Buddhists. The Dalai Lama XIV stressed that the Temple should become a symbol and a place to join all schools of Buddhism including not only Tibetan but also Theravada, Dzen and other schools. He also noted the necessity of setting up the Buddhist Cultural Center which would function in the Temple as a social center providing opportunities of getting knowledge on Buddha’s teachings, Buddhist philosophy and morality. His Holiness expressed his wish to make the Temple a place of the spiritual practice as well as the center of the social, cultural and educational activities. His Holiness the Dalai Lama XIV blessed the construction of the Temple and expressed his gratitude to those who are taking part in this Project.